We’d love your help. Let us know what’s wrong with this preview of Beginner's Guide to Colorwork Knitting by Ella Austin. To ask other readers questions about Beginner's Guide to Colorwork Knitting, please sign up. Beginning knitters often fear colourwork knitting for several reasons. This book provides 16 different projects that introduce different colourwork techniques. From simple stripes, to jogless stripes in socks, to an entrelac shawl. The colourwork techniques as well as materials used and basic knitting instructions are provided in well-written instructions. I'd recommend this book for beginner to advanced knitters, since it is ia good resource book to have at hand, if you haven't done any colourw Beginning knitters often fear colourwork knitting for several reasons. This book provides 16 different projects that introduce different colourwork techniques. From simple stripes, to jogless stripes in socks, to an entrelac shawl. I’ve always loved to knit or crochet, and whilst I’m pretty good at crocheting, my knitting leaves a lot to be desired. One of the big things I struggle with is adding colour to my knitting, and finally here is a book that gives me step by step instruction on how to add colour to your work. There are lots of projects to try and all give clear instructions on what to do. It is explains the charts used when following colour work, some look easier than others though! There are tutorials for adding a I’ve always loved to knit or crochet, and whilst I’m pretty good at crocheting, my knitting leaves a lot to be desired. One of the big things I struggle with is adding colour to my knitting, and finally here is a book that gives me step by step instruction on how to add colour to your work. There are lots of projects to try and all give clear instructions on what to do. It is explains the charts used when following colour work, some look easier than others though! There are tutorials for adding a different colour in and how to weave in your ends! I would say you do need to have a basic knowledge of how to knit as it doesn’t show you how to knit from scratch, so would say that this book is aimed from the intermediate level upwards! I can get by in knitting and looking through the patterns would just about be able to follow them. The patterns in the book are beautiful and range from washcloths to shawls and blankets – definitely something for everyone. It is an American book, so the terminology is predominantly for the US, but it does include English sizes for needles etc., which is always useful!! A lovely book if you want to learn how to add colour into your knitting projects, if you want to brush up on your skills or if you are an accomplished knitter who just wants some different projects to do! Many thanks to NetGalley, Ella Austin and Sewandso Publications for an ARC in exchange for an honest review. All opinions are 100% my own and independent of receiving an advance copy. At first glance there didn’t seem to be too much to this book. I have read quite a few books on colour knitting as of late and most have been disappointing. The patterns in this book were okay, some were things I liked and would want to knit, but there didn’t seem to be enough ones I liked to warrant buying the whol Many thanks to NetGalley, Ella Austin and Sewandso Publications for an ARC in exchange for an honest review. All opinions are 100% my own and independent of receiving an advance copy. At first glance there didn’t seem to be too much to this book. I have read quite a few books on colour knitting as of late and most have been disappointing. The patterns in this book were okay, some were things I liked and would want to knit, but there didn’t seem to be enough ones I liked to warrant buying the whole book. But as I started to read through I realized that Austin has done an incredible job as far as giving thorough explanations and explicit diagrams. Every detail including finishing techniques, combining different colours, creating beautiful colour patterns and intricate colour techniques are explained in such an easy and clear manner even things I already knew how to do seemed clearer and made more sense to me. The diagrams are also unique in that they show exactly what she is talking about. I’m not sure if it is just more steps or a different way of showing them, but again, even things I have been doing seemed easier to understand. Even though there are some patterns I might not be interested in, I think I would make every pattern in the book because Austin has a step by step plan of increasing your colour work skills. Each pattern adds one more skill and I think it is worth the practice. There is an opening section describing colour, how they work together, which ones are warm or cool, different hues, etc. and to be honest, I only understood some of it. The easier concepts I understood but it got too technical or complicated for me. If I were planning my own colour work project from scratch, I would have to go back and use it as a reference to see if they worked together properly. I don’t really feel confident on that part. However, because Austin has explained how the colours work in each project, I would be more comfortable starting with colour substitutions for the patterns. She does an excellent job of combining theory with practice with lots of tutorials. There is also the prerequisite chapters on needles, stitches, reading charts and anything else that you would need in order to make any of her patterns. My favorite part of this book is the depth in which the author goes to ensure success with colors. If you have ever knitted with two colors that are both beautiful, yet find the finished pr New and seasoned knitters will enjoy the patterns and techniques in Beginner’s Guide to Colorwork Knitting. Basic patterns are included for items such as a scarf, socks, hat and reversible cowl. The key to this informative book is how to work with color and master new techniques to create beautiful knit items. If you long to knit stunning fair isle jumpers and brightly coloured blankets for your home this is the perfect book. Learn all the techniques for how to start knitting with colour and create really desirable projects as you learn. Choose from brightly coloured stripy socks and work your way I received a DIGITAL Advance Reader Copy of this book from #NetGalley in exchange for an honest review. Choose from brightly coloured stripy socks and work your way up to a patterned beanie hat and even a stunning sweater with a colourwork yoke. Even if you can only knit and purl--with this book you'll be making gorgeous colourwork accessories before you know it! I love to knit at my parent's place as there is no cat to interfere with the yarn! I usually make boring scarves and these patterns are a great idea to add pizazz with colourwork to my projects. The instructions are clear and concise and the photos gorgeous - knitter of any level will enjoy this book! Beginner's Guide to Colorwork Knitting is a comprehensive starting point for color knitting techniques: stripes, illusion knitting, slipped stitches, mosaic, stranded colorwork, intarsia, double knitting, modular knitting, and entrelac. Colorwork starts with an overview of color itself and explanations of terms that are often heard but not as often explained: hue, value, and saturation. There is the standard section of basic knitting information and tools needed, as well as a primer on reading cha Beginner's Guide to Colorwork Knitting is a comprehensive starting point for color knitting techniques: stripes, illusion knitting, slipped stitches, mosaic, stranded colorwork, intarsia, double knitting, modular knitting, and entrelac. There is the standard section of basic knitting information and tools needed, as well as a primer on reading charts, as needed in the patterns. The book assumes the knitter has familiarity with basic knitting skills, although pictorial instructions for techniques are given at the end to refresh your memory. Photo tutorials are spread throughout the book, each teaching a different colorwork style or skill necessary to complete the pattern. While the patterns aren't anything groundbreaking (I have seen a few of them before), they illustrate the styles of colorwork well and are good "first projects" to try out. One project in particular, the Thorn Stitch Shawl, stands out as something I would like to knit. An excellent introduction to colour-work knitting. The basics are clearly explained with plenty of photographs and diagrams. Each skill is built upon with a range of interesting patterns that are suitable for beginner knitters but also interesting enough to appeal to the more advanced knitter. I have would definitely recommend this book. I received a free review copy from the publisher in exchange for my honest unedited feedback. This book would be great for the knitter wanting to jump into colorwork as well as the more seasoned knitter looking to try something new. Projects begin simply with stripes, only requiring the changing of yarn to create the colorwork. As the reader progresses through the book, the difficulty of the projects increases allowing the knitter to build on their skills. Colorwork directions are written as well as charted. Other knitting skills can be built as well through the projects, such as steekin This book would be great for the knitter wanting to jump into colorwork as well as the more seasoned knitter looking to try something new. Projects begin simply with stripes, only requiring the changing of yarn to create the colorwork. As the reader progresses through the book, the difficulty of the projects increases allowing the knitter to build on their skills. Colorwork directions are written as well as charted. Other knitting skills can be built as well through the projects, such as steeking with the Steeked Mug Cozy. New skills needed are clearly illustrated in writing as well as through the accompanying photos. The 16 projects cover all the basics of colorwork including stripes, slipped stitches, stranded colorwork, intarsia, double knitting, modular knitting and entrelac along with a lesson on color theory. This is a great introduction to colorwork! I received an ARC of this book to read through NetGalley in exchange for a fair review. Beginner’s Guide To Colorwork Knitting by Ella Austin is a collection of 16 projects with a number of tutorials on the techniques used for each project that are easy to follow with beautiful pictures and clear illustrations and charts to guide the beginner in exploring colorwork knitting. Everything is clearly explained from choosing colors to stripes, stranded colour work, doubleknitting, intarsia, modularkn I received an ARC of this book to read through NetGalley in exchange for a fair review. Beginner’s Guide To Colorwork Knitting by Ella Austin is a collection of 16 projects with a number of tutorials on the techniques used for each project that are easy to follow with beautiful pictures and clear illustrations and charts to guide the beginner in exploring colorwork knitting. Everything is clearly explained from choosing colors to stripes, stranded colour work, doubleknitting, intarsia, modularknitting and entrelac. I would recommend this book not only for beginners but also more experienced knitters looking to learn new techniques. This is a great resource for all skill levels. There are easy instructions to help with the projects. I loved the pictures which help me visual my finished project. The colors add excitement to endless possibilities. I received an advanced digital copy of this book from Netgalley.com and the publisher F+W Media, Sew and So. Colorwork makes me a nervous wreck. I used to avoid it. Now, after reading Ms. Austin's book of techniques and patterns, I have the confidence to knit all the colorwork I want to try. Clear and concise patterns and beautiful photography that feels like you've stepped right into the author's instagram account. Beginner's Guide to Colorwork Knitting should become a staple of the knitter's ref I received an advanced digital copy of this book from Netgalley.com and the publisher F+W Media, Sew and So. Beginner's Guide to Colorwork Knitting should become a staple of the knitter's reference library. A great book for beginners. The projects are varied and attractive, the explanations are clear and well illustrated to allow for good understanding. The tutorials for the various techniques required in the projects are simply explained but complete. Disclaimer - I received a free digital copy courtesy of F+W Media and NetGalley in exchange for an honest review. If you long to knit stunning fair isle jumpers and brightly colored blankets for your home this is the perfect book. Learn all the techniques for how to start knitting with color and create really desirable projects as you learn. Choose from brightly colored stripy socks and work your way up to a patterned beanie hat and even a stunning sweater with a colorwork yoke. Even if you can only knit and purl--with this book you'll be making gorgeous colorw Originally reviewed at West Coast Book Reviews. If you long to knit stunning fair isle jumpers and brightly colored blankets for your home this is the perfect book. Learn all the techniques for how to start knitting with color and create really desirable projects as you learn. Choose from brightly colored stripy socks and work your way up to a patterned beanie hat and even a stunning sweater with a colorwork yoke. 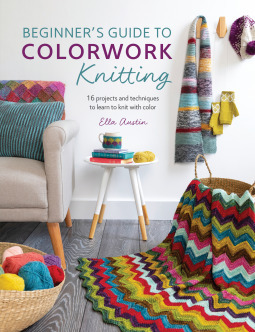 Even if you can only knit and purl--with this book you'll be making gorgeous colorwork accessories before you know it! 1. Don't skimp on the pictures! Take them outside, for starters, and do it somewhere gorgeous and simple. 2. Feel with your eyes. Make sure the textures come to life. I want to feel gossamer laces between my fingers, caress the delightfully full and smooth touch of silk and the sturdy crunch of wool simply by looking. 3. Balance the pictures with a well composed layout. Keep it simple (my eyes aren't as young as they used to be.) Guide me with a grand font, keep me turning the pages, and reassure me nothing has been left out. 4. Make sure it's something I'd trash that wooden bowl thing on the coffee table for. If I'd leave it in the centre of the table for everyone who came through my door to see because I want them all to know about it, you've put together something special. 5. (I know, right!) Make me want to put confidence in my craft and pick up "real yarn" to realize everything the book has inspired in me. Ella Austin's Beginner's Guide to Colorwork Knitting earns points for me in all four (five) categories. I found it an indispensable resource on basic colour theory. I usually find a variegated that I a) like, and b) has a matching solid. The book gives an easy to understand why when it comes to mixing colours and tones to come up with a balanced and beautiful palette. I also look for a knitting book that will enhance the skills and resources I already have; one which will fit in to my way of doing things without forcing me to re-write anything. I was able to enhance my understanding of steeking and double-knit with an online video, then jump back to the book to help reinforce my understanding. A great addition to anyone's knitting library. The pictures are beautiful and the patterns are easy to read. Thank you to Netgalley for my review copy. Beginner's Guide to Colorwork Knitting is a tutorial knitting guide with instructions for 16 projects which integrate color changes in the patterns for different items using different colorwork techniques. Released 19th March 2019 by Sewandso, it's 128 pages and available in ebook and paperback formats. The book is written in an encouraging and accessible manner. There is a distinct 'you can do it' vibe throughout, which I found charming. The book's Originally published on my blog: Nonstop Reader. The book is written in an encouraging and accessible manner. There is a distinct 'you can do it' vibe throughout, which I found charming. The book's introductory chapter (about 20% of the total content), has a surprisingly comprehensive discussion of color theory. The introductory chapter does not include any instruction on how to cast on or knit, that info is provided at the back of the book in the final appendix chapter. The tutorial project chapters are arranged very roughly in order of ascending difficulty. The first project is a striped rectangular scarf in garter stitch which shouldn't be beyond the capabilities of anyone who has learnt to cast on and knit. This would also make a good stash buster project for those of us with odds and ends of balls of yarn collected over the course of other projects. The next projects in the section introduce shaping (chevron blanket), colorwork in the round (with a nice trick for getting 'jogless' row shifts), and carrying unused colors up the side of the work. There are also other projects which have tutorials for slipped stitch colorwork, stranded work, intarsia, double knitting, modular knitting, and entrelac. The projects themselves are a mixed lot, with some very pretty accessories and soft furnishing included. The lack of a visual gallery style index detracted a bit in my opinion. There is no main listing (in my eARC) of all the projects together. Well written, very basic projects, with a good selection of techniques. Four stars, aimed at beginning knitters or knitters looking to add a few techniques to their repertoire. I wasn't sure what to expect when I got this book. It has colorwork in the title so I'm thinking Icelandic sweaters and fair-isle vests but the cover and description lead me to think something entirely different. Which it, oh so fabulously, was. What this book actually is is a step by step beginner-level guide to working with more than one colour in knitting projects. It's amazing how beginner it actually starts. I was sitting at work the other day working on my vertices unite shawl (section A th I wasn't sure what to expect when I got this book. It has colorwork in the title so I'm thinking Icelandic sweaters and fair-isle vests but the cover and description lead me to think something entirely different. Which it, oh so fabulously, was. What this book actually is is a step by step beginner-level guide to working with more than one colour in knitting projects. It's amazing how beginner it actually starts. I was sitting at work the other day working on my vertices unite shawl (section A that goes on and on and on) and a colleague who is a beginner knitter asked how I got the stripes in without breaking the yarn each time. That sort of knitter is the perfect recipient for this book. It takes you from a simple striped scarf to an Entrelac wrap and gives you enough instructions that I have no doubt that if you started at the beginning of the book as a beginning knitter you could confidently gain the skills you need by the end of the book. Hell, it even shows you how to make a pompom. This book combined with some balls of colourful wool would make an excellent gift for a beginning knitter. And at the price it's currently listed for as an ebook it's excellent value for money, particularly how it steps you through the basics that can make or break a knitting project. This book explains all the techniques of colorwork knitting AND has 16 wonderful patterns. There are very clear directions with lots of diagrams showing the work process. Each of the projects has one or more tutorials on how to do a particular technique needed for the project. Many of the projects are relatively small (washcloths, hats, mug cozy, cowl, mitts) so that you can complete it in a short time while trying out a new technique. There are clear directions for cast on, cast off, Kitchener This book explains all the techniques of colorwork knitting AND has 16 wonderful patterns. There are very clear directions with lots of diagrams showing the work process. Each of the projects has one or more tutorials on how to do a particular technique needed for the project. Many of the projects are relatively small (washcloths, hats, mug cozy, cowl, mitts) so that you can complete it in a short time while trying out a new technique. There are clear directions for cast on, cast off, Kitchener stitch, increasing and decreasing stitches, double knitting, intarsia, pom poms, tassels, etcetera, making it a very useful reference book in addition to the great patterns. Beginner's Guide to Colorwork Knitting by Ella Austin is a free NetGalley ebook that I read in early March. 16 projects and 22 tutorials toward honing a specific skill in knitting (corrective shaping, switching colors, knitting styles, weaving loose ends into the body of a garment) and switching between anywhere from two to ten different colors. There's a wide use of charts and abbreviations, but fret not, there are also written instructions. Personally, I adore the look and doability of illusion Beginner's Guide to Colorwork Knitting by Ella Austin is a free NetGalley ebook that I read in early March. Such a well written guide for the beginning color knitter (me)...I especially appreciated the explanations for the striped socks and carrying the colors inside the sock...great photography and some beautiful patterns to learn with. The Brick Stitch washcloths are a joy to knit. I look forward to stitching the Thorn Stitch Shawl, too. This is a really fun book for both beginning and intermediate knitters. Easy to read and with photos and suggestions for yarn, it's a worthwhile purchase. Okay, I'll admit it. Even though I've been knitting for over 30 years, I still find colorwork intimidating. Not simple stitches or patterns using stripes or slipped stitches but the more complex types of colorwork. Multiple strand techniques and entrelac are something that I admire, but I've never felt quite comfortable doing. So I couldn't quite resist this book. The book is structured into 22 tutorials and 16 colorwork projects. As you would imagine, things start off simply with a simple striped scarf and a chevron blanket. The author details with good photography how to change colors and how to weave in your ends on different types of stitches in the early tutorials. She moves on from stripes to slip stitches to stranded colorwork, ending with more complex techniques like intarsia and entrelac. Projects are varied: hats, socks, mitts, mug cozies, buntings, scarves, bags, washcloths, shawls, and even a cushion. As you might imagine from the list of project types, while this might be a beginner's guide to working with color, it is not a book for knitting novices. The complexity socks and mitts with thumbs--as well as scary techniques like steeking--require more than a beginner's skill in knitting. I would say that you need to be at least an intermediate level to get the most out of this book. Of course, even beginners will be helped to learn the basics of colorwork and perhaps will be inspired to continue knitting so they will one day be able to do some of the more complex projects in this book. The tutorials are scattered throughout the entire text, and there is also general information in the front about choosing colors, yarn, tools, and reading charts and in the back about getting started, basic stitches, and basic and advanced techniques. There is also a section at the beginning that discusses the concepts involved in color like saturation and hue. There are a couple of things I found strange about the book. While the title uses American English for the spelling of colorwork, throughout the book itself colorwork and other words use British English spellings; I’m a copyeditor, so I say: pick a style, and be consistent. More odd is that the tutorials for a given project come after the project, not before. To me, it makes more sense to put the tutorial in front of the project that requires that information. I do think that the book would be better organized if the tutorials came before the relevant project, especially for projects using the more difficult techniques like steeking, intarsia, and the first forays into stranded colorwork. Wow! This is a fabulous book, full of colour, knitting techniques and projects. There are 22 projects, starting with very simple and quick colour work knitted items, each highlights techniques and method of knitting to get a professional finish. Although this is a beginners book, the result achieved are ones that an advanced knitter would be proud of. Well illustrated with good explanation and plenty of photographs and drawings. Firstly there are the simple items using stripes, then slipped stitch Wow! This is a fabulous book, full of colour, knitting techniques and projects. There are 22 projects, starting with very simple and quick colour work knitted items, each highlights techniques and method of knitting to get a professional finish. Firstly there are the simple items using stripes, then slipped stitched, stranded colour work, to a little more difficult intarsia to double knitting, modular and finally entrelac, all are covered in this wonderful book. I really enjoyed this knitting book and would recommend it to anyone who wants to take their craft further. It has been adapted for both American and UK users. Colourwork for anyone who hasn't done it is quite daunting. The instructions take you through different techniques step by step and each project is achievable. I have been knitting for a lot of years and although some of the techniques were familiar I had never heard of Steeking! Great book with good illustrations and instructions. The patterns in this book look good, and show exactly how they are made. I have done some colour work in the past, and found myself with a giant headache trying to keep the instructions clear. Some patterns are a bit more difficult, but the instructions given are helpful and informative. Worth a look if you want to get into knitting with colour.